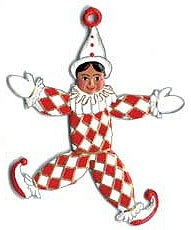 This Jester pewter Christmas ornament hand crafted by Wilhelm Schweizer is one of a kind! View all of Schweizer's Christmas Ornament Collection for unique gifts or collectibles. Plus, get free shipping on all your German pewter ornament orders!